left to right: Otto W. K. Lee, Ed.D., president of Los Angeles Harbor College; Gene Seroka, executive director at the Port of Los Angeles; Willie J. Hagan, president of California State University, Dominguez Hills; and Joe Buscaino, Los Angeles city councilmember for the 15th district. California State University, Dominguez Hills (CSUDH), Los Angeles Harbor College (LAHC), and the Port of Los Angeles (POLA) signed a Memorandum of Understanding (MOU) on Aug. 10 at the port that provides the framework for creating refined global logistics curricula at both campuses, and lecture and internship opportunities that will help prepare students for new and emerging trends in port logistics. Under the agreement, CSUDH and LAHC agreed to align global logistics courses at LAHC with undergraduate global logistics courses at CSUDH, which will help boost the number of qualified LAHC students transferring to CSUDH to pursue Bachelor of Science degrees with global logistics concentrations. Both institutions will regularly consult with the Port of Los Angeles to assure integration of emerging and relevant logistics topics into curriculum. At the campuses, CSUDH and LAHC will work together to align global logistics curricula at LAHC with undergraduate courses at CSUDH, as well as review and refine global logistics and related courses on an ongoing basis. Both institutions will consult with POLA annually regarding new and emerging topics that will be integrated into their courses, and will collaborate on an articulation agreement that will provide a formalized and “seamless pathway” for LAHC global logistics students to transfer to CSUDH. 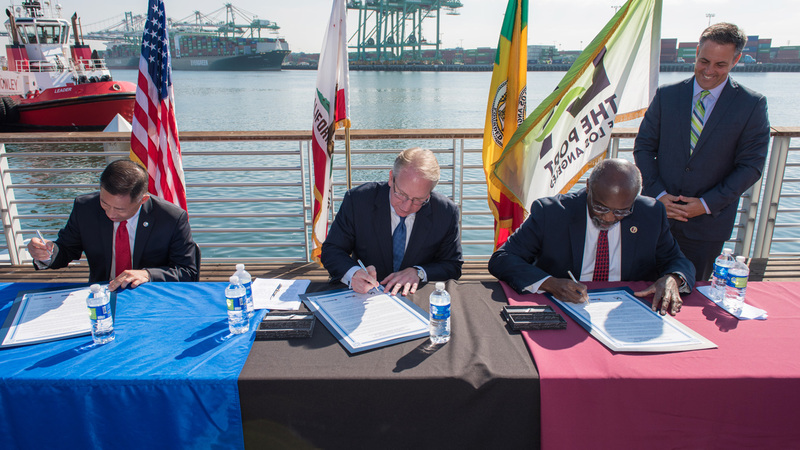 The MOU also calls on the port to designate up to 10 CSUDH and five LAHC paid internships annually for students interested in gaining hands-on experience within port departments in global logistics and related fields of study. Port staff will also serve as guest lecturers in classes to provide additional real-world learning opportunities for students. According to “Strengthening Los Angeles,” a recent report by JPMorgan Chase & Co., global trade and logistics is one of two top fields in the region and nation with strong middle-skill job opportunities.